Creating a bathroom that is not only stylish but also well-designed and functional is a balancing act, and the first step toward adding function and achieving your desired look is to install some beautiful floor tiles. But with such a vast and ever-increasing choice of options, it can be difficult to know where to start. Let us offer you a little help. 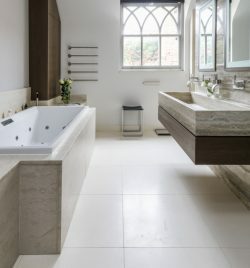 A lovely limestone floor works hard to create a calming, neutral and sophisticated space and will both compliment and be invigorated by the crisp white of a bathroom suite. Our Blanc Limestone Honed for instance, adds real vigour to the bathroom. This limestone offers a gentle yet time-worn aesthetic giving it the feel of belonging to a home with a heritage. Marble tiles suggest luxury and remind me of the cool, classic, five-star look that is the domain of luxury hotel bathroom suites. But, it can also live quite unpretentiously in our humble homes. 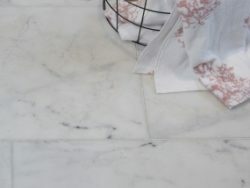 Our Athena Marble Honed floor tile can be used on the walls too, and offers a classic and timeless style that will make any bathroom look like a million dollars. 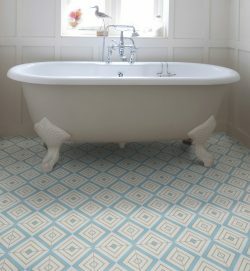 The British love for patterned tiles shows no signs of slowing down. Patterned tiles add colour, pattern and a touch of personality in this functional space. If you want to add life to a conventional white bathroom suite, patterned tiles are a perfect way to do it. Our beautiful and exotic looking Darcy Pattern Tile is just the thing to inject a boat-load of personality into your bathroom. Slate is smart, durable and naturally good looking. The charcoal tones of slate on floors creates a moody, cocooning effect. 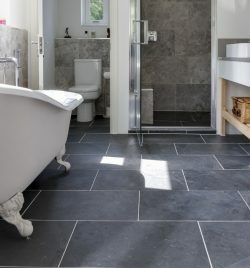 Our Metropolitan Slate Riven, with its beautiful natural tones, is stunning in a period bathroom. There is nothing more warming and life-giving that shades of wood in the bathroom. 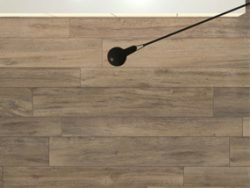 Real wood is not the best material for the bathroom floor without thorough sealing, but wood-effect tiles give the desired look but with the practicality too. Our Chateau range is a porcelain, wood-effect tile and is available in an array of finishes to suit different styles of bathroom. Your bathroom is an important part of the home so make it beautiful as well as functional.